San Francisco painter David Michael Smith presents another gorgeous, exceptionally well executed body of work that furthers his exploration of the relationship between humans and the natural world (on view through January 31). Primarily figurative and narrative, the works prominently feature one male or female figure, generally from the bust up. Ages vary from infant to young adult, but they share one commonality: they are all undeniably beautiful people. Additionally, the works feature flowers, often huge, and/or an animal, be it a black bird, a horse, or an ermine. And while at first glance these can appear as simply very pretty pictures, which indeed they are, they feature the tension of threat that lends them a subtle air of doom or danger: the flowers, based on those by the Dutch masters, loom large in the background, as if they might consume the subject. The black bird, which sits behind the shoulder of a young boy, has a powerful-looking hooked peak. The ermine’s sharp claws rest on the naked breasts of a woman. 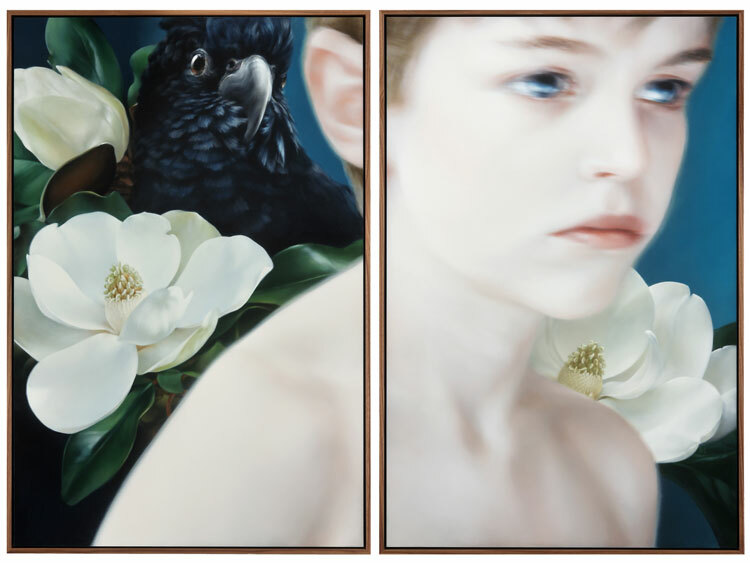 Though the fauna and flora occupy the same visual space as the figures, there is a palpable disconnect — the attractive subjects are oblivious to the beauty that surrounds them. Further, they present an implied viewing angle, sometimes directed at the viewer, sometimes off to the distance, that evokes a feeling of disengagement. Unlike Smith’s previous bodies of work, which were all very precisely painted, a few of these pieces feature blurs and smears reminiscent of Gerhard Richter’s squeegee works. The effect provides a sense of movement, of time passing. Pushing his prodigious talents even further for this show, the artist sidles up to that sweetly evocative line of too precious, too lovely, without so obviously revealing why they’re not. All the while that the picture unfolds itself, the viewer has something sublime to look at.